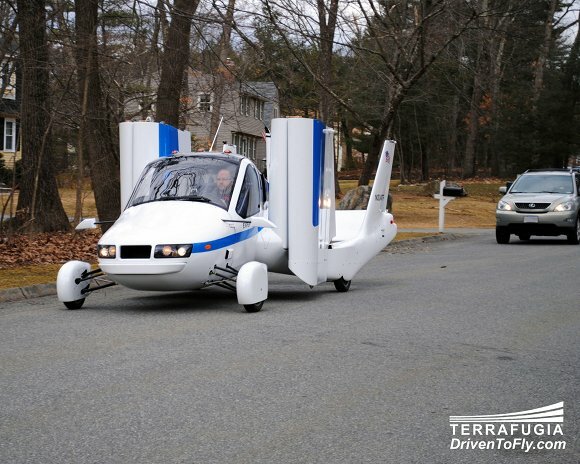 Analysis Not long ago the famous Massachusetts startup Terrafugia caused something of a stir by releasing details of a new electric hybrid flying-car design, the TF-X - though the company is now very late in delivering even its less-radical Transition design. We here on the Reg flying-car desk have always liked the idea of the Transition - unlike most personal air vehicle schemes there is nothing wildly ambitious about it and it's easy to imagine it really being built and sold. Also, again very differently from most of its competitors, the Transition has actually had test flights. Regular readers will no doubt be familiar with the Transition. In essence it's a simple idea: a plane which can fold up its wings and drive safely on roads. It's not meant to take off outside your house and land on your office roof or anything - rather, it would take off and land at normal airstrips just like any other light aircraft. But then, rather than having to be tied down or put into a hangar while its pilot arranged ground transport onwards, it would simply drive out of the airport gate to wherever he or she was going and park just like a car. It's not a machine for the daily commute, nor is it a flying car for everyone: an expensive and troublesome-to-obtain pilot's licence is required to fly it, albeit a somewhat less onerous sport-pilot ticket as opposed to a normal private pilot qualification. In the event of bad weather, which generally grounds ordinary private pilots who don't hold expensive professional instrument ratings, the Transition owner would simply drive the whole way on the ground. It's a car, and it flies - simple. But not so simple to actually get into production, it turns out. Terrafugia had hoped to be delivering Transitions in 2009, but has yet to ship its first one. A prototype did fly that year, but after tests were completed the Transition design was altered significantly and another prototype took to the air last year. Production had been expected to start shortly thereafter, but in fact it has not - and, perhaps ominously, the company no longer much cares to say when it might. 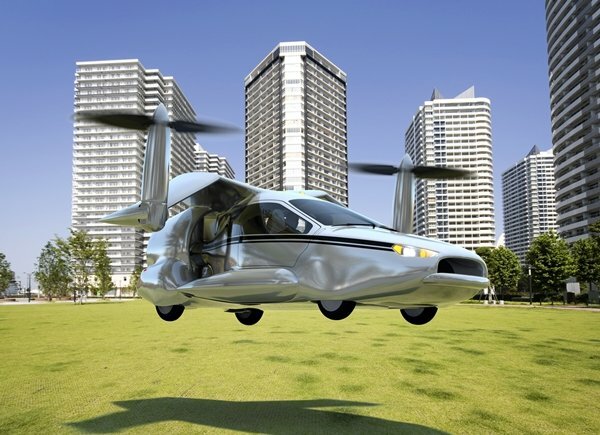 Against that sort of background, it seemed more than a bit worrying when Terrafugia splashed new CGI video and press releases this week which said nothing about the Transition - but instead outlined radical plans for a full-on Jetsons style flying car. The TF-X, expected in "eight to twelve years" has everything that the Transition doesn't. It's quiet - perhaps quiet enough to operate in urban areas. It can take off and land vertically. Anyone can fly it, as it doesn't need piloting as such: you simply tell it where to fly to and it does the rest. That's a car which could potentially set down on the office roof - or in the parking lot anyway - having lifted off from the owner's driveway. And in true tech-trendy style it uses a partly electric, hybrid propulsion system, fashionably including the ability to plug in to a power outlet for recharge. All in all, then, the TF-X is a lot less intuitively plausible than the Transition - and given Terrafugia's tight-lipped stance on the Transition, and its keenness to speak of the TF-X, it was possible to suppose that the company had gone the way of too many other flying-car inventors - long on vapourware and CGI, and short on actual working hardware. So we got in touch with the people at Terrafugia and asked a few questions. Firstly, we wanted to know what's going on with the Transition - the flying car that might actually get delivered in the near future. 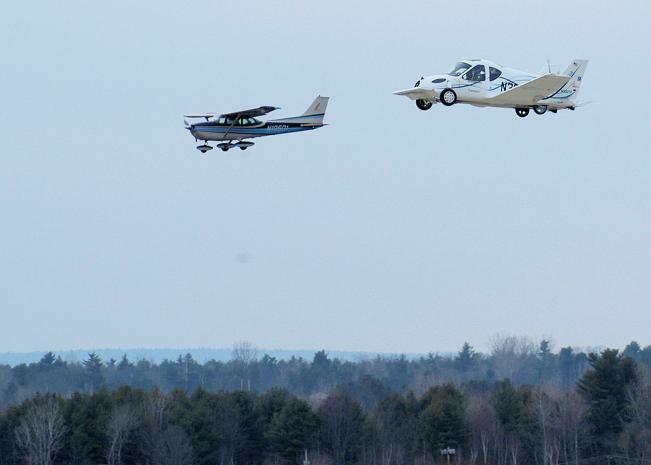 Terrafugia spokespersons confirmed what we had suspected: that another redesign has been found necessary following the most recent set of flight and ground tests. Another prototype will appear once this has been done, which will then be tested in its turn - and if all goes well, production and deliveries will commence at last. And this process will take a couple of years at least, as it did last time. Transition 2.0 ... what will 3.0 look like? We are working on an additional redesign cycle now that was not anticipated at the beginning of the program. This redesign will address some issues that were discovered during the testing that has been ongoing for over one year now. After this redesign is complete, Terrafugia will build a body-in-white (BIW) for physical crash testing, a drive test mule, and what we expect to be our final flight test prototype prior to production. Depending on what happens with the crash testing, first delivery is estimated to be between January 2015 and March 2016. While it is obviously true that we missed our early estimates, we also have continued to show significantly more risk reduction per dollar invested than our investors expected. In our opinion, and the opinion of investors who are writing checks to fund the company, the investment value and return potential is significantly higher today than it was when the company started. We continue to attract more investment as we show progress toward bringing a product to market, reduced risk, and now a much higher long term growth potential for the company. So the Transition third iteration is apparently funded, and if it can tick all the boxes it will be in customers' hands in a couple of years. Perhaps the engineers at Terrafugia could even squeeze in a bit more useful load in the current redesign: as we've pointed out before, the last reworking left the craft with so little that it had become basically a single-seat machine if it was to take off fully fuelled (though two passengers and some light luggage could lift off safely if the tank was half empty). So your actual real flying car is still on the way, or at least there's a reasonable chance it is. But I'm not a pilot, and I hardly ever drive past a couple of airstrips during a journey. What about me? But what of the TF-X? After all, most of us aren't pilots. Most of the journeys most of us make don't pass near a couple of handy airstrips which would let us do part of the trip airborne in a Transition, weather permitting. Where's the flying car for the rest of us? Is it really feasible? At first glance the answer would seem to be a pretty firm no - it isn't. A simple comparison with the only tilt-rotor aircraft actually flying in any numbers - the MV-22 Osprey - doesn't look good for the TF-X. An Osprey lifts off weighing 50,000lb (22.7 tonnes) using 9 megawatts of power. The thrust discs of its big props are loaded at around 20lb per square foot. We can see from the vid that the TF-X's prop discs are around a hundred feet2. With a megawatt of lift power available, it's clear that the TF-X is expected to have heavier disc loading than the Osprey and as such it won't generate as much lift per watt. In rough envelope-scribble terms the TF-X's maximum all-up weight must be a good bit heavier than 2,000lb and a good bit lighter than 5,000lb. Say 4,000lb to be kind - Terrafugia didn't care to give any specifics. Subtract 800lb for people and 400+lb for the cruise engine at the back and its fuel - presumably it's a relatively conventional lightweight internal-combustion job or something similar (again, Terrafugia are reticent). Assume for the moment that the airframe, wingtip rotor pods, avionics etc weigh nothing. That leaves a maximum of 2,800lb for a battery pack which is able to put out 670 kilowatts (Terrafugia did specify that the engine will be feeding power to the rotors as well during hover operations, so the requirement is 900 horsepower not 1200). That battery pack needs to be able to survive a road crash safely as well - this is a flying car, remember. One of the best road-safe certified power packs you can buy (provided you have deep pockets) is the one in the Tesla Roadster battery supercar. It can put out 215 kilowatts: three of them could provide almost all the juice we need to get the TF-X off the ground. Unfortunately three Roadster battery packs weigh 2,970lb on their own. That's too heavy already, and we haven't even allowed for the weight of the airframe, rotors, motors etc. And that's not the only problem: those Tesla powerpacks can't sustain that level of output for long. The theoretical maximum is just under 16 minutes, but in real life it would be much less. Prior to departure, the operator selects a primary target landing zone and backup landing zones. If the TF-X™ calculates insufficient energy on board to conduct last minute aborts at the first two sites and safely navigate to and land at the third within a 30 minute reserve, or if the forecast weather in any of the three landing zones would be outside the allowable limits, or if any of the selected landing zones are in temporarily restricted airspace (TFRs), departure will not be allowed until appropriate landing zones are selected. Basing your numbers on the Tesla battery pack is not representative of the state of the art in battery technology today - it is representative only of what is certified for automotive use. Tesla's packs are designed for long range and crash - not high power-to-weight and crash. Our concept relies on higher power density cells than Tesla uses, combined with a different strategy for crash. These cells exist today but are not yet certified for road use. That's a fair point: there are battery technologies which theoretically might offer a considerably lighter battery pack with the necessary power - though there aren't that many which would leave much of a margin for airframe, motors, rotors etc. Whatever Terrafugia are eyeing, they'll have to make it road-crashworthy as Tesla did. And the fact remains that the Tesla packs, optimised for endurance as they are, are already pretty marginal on the length of hover time they could deliver. Switching emphasis to power rather than energy would in all likelihood cut this time even further. Your point that there will be a limited hover time is correct. We estimate the time will be sufficient for two or three aborts before a horizontal landing would be required. Which is fair enough again: if the computer autopilot couldn't get the TF-X down before the battery approached exhaustion, it could always revert to aeroplane flight and head off for a runway, where it could make a rolling landing under engine power alone. Still though, when you reflect that enough ordinary light-aircraft engines to provide the required hover horsepower would only weigh 1400lb-odd, you have to wonder just why the enthusiasm for batteries among PAV inventors these days. To be sure, electric thrust would be quieter and less prone to breakdown than normal engines, and the need to put heavy weights at the wing tips is reduced: these are good things for flying cars. The fact is, however, that those light-aircraft engines have always been there and yet there are very few operational tiltrotors in the world, and those there are belong to exotic branches of the US military with special requirements (namely the Marines and the Special Ops command), not commercial organisations or wealthy individuals. They aren't powered by piston engines either; they need the improved power-to-weight offered by gas turbines. So it would seem that tiltrotors are just not simple to make, and the chance of genuinely making battery-powered ones (which can fold and unfold rotors in midflight, too) is pretty slim. You know what would probably work? So the TF-X and other VTOL designs do seem quite unrealistic. And the Transition as it stands isn't really a flying car as such, though it is a car which can fly, if you happen to be a pilot and there's an airstrip handy. But there is a realistic way forward even so. Quiet, affordable VTOL without destructive downwash is probably just a dream: but a quiet short-takeoff winged craft might not be. Highly reliable robotic takeoff, landing, cruise flight and traffic control certainly isn't a dream - the problems are actually easier than robotic ground cars, and they have pretty much been solved already. Once you had a working Transition, you would surely not bother trying for VTOL. The next step would surely be to improve it's STOL performance - perhaps using electric hybridisation, if this genuinely seemed to help - and add a robot autopilot (major parts of which are already on offer). Such a machine could set down or depart making no more noise than a lorry from the sort of small strip you could fit into a supermarket car park, or tack onto an existing road or street with no more difficulty than adding a layby. Such mini-strips could be scattered across a city, and associated multiply redundant automated traffic-control infrastructure added, for tiny fractions of what it costs to build a new railway line or freeway through such terrain. Out in the suburbs or the countryside the cost would be even less. You might let fully-licenced pilots fly on manual control, but probably not above urban areas (indeed private pilots are already mostly barred above big cities today). The robots would do a much better and safer job. And there you'd have it: access to the third dimension for relatively ordinary people. Needless to say there would be a few aircars suffering mechanical failures every once in a while and descending on parachutes (the Transition is so equipped already). The occupants would be fine, as these aren't normal light aircraft: they have much better crash protection. There'd be some damage to buildings, or perhaps even unlucky bystanders, on some occasions, which would lead the usual witless Luddites to call for a ban - but they would not be listened to by sensible folk, any more than sensible folk would countenance a ban on trucks or buses just because they (frequently) smash into buildings or run people over. It would also be possible to make the broken-down aircars come down in safe places most of the time: robot-guided parachutes capable of quite accurate into-wind landings are already available. NASA once had a plan to push this more realistic kind of flying car, which it referred to as a Personal Air Vehicle (PAV). The agency had intended to build an affordable (car engined) light STOL aircraft, which would be very quiet as it was propelled by a ducted tail fan rather than a normal propellor (a bit like the TF-X). Sadly that project was axed in 2005. Lewis Page holds a UK private pilot's licence, though changes in his disposable income in recent years have meant he's no longer current.